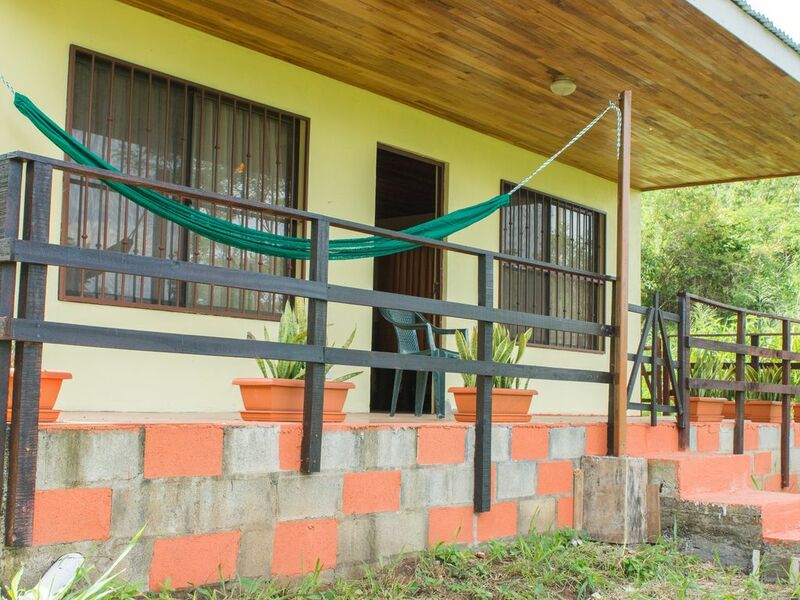 Recently built, spacious studio cabin at Butterfly Dance Development, twelve miles west of San Ramon towards Puntarenas, off the Pan American Highway. View of the Gulf and Puntarenas from adjoining road. Furnished, sleeps 2, twin beds. Kitchen with counter and stools; bath. Kitchen includes fridge, microwave, stove, slow and rice cookers, coffee maker, kettle, and toaster. Linens and towels included. Floor fan. Hammock for patio. Car port. We have had many inquiries about internet service and are now happy to announce internet (wi-fi) service. We can include wi-fi service with 2 weeks advance booking. There is a refundable deposit of $45 for the use ad return of the mifi modem. Ideal Central Valley location to visit most of Costa Rica: 25-30 minutes to San Ramon and Puntarenas, 1 hour to Atenas, Jaco, 1 hour 15 minutes to San Jose, La Fortuna, 2 hours plus to Manuel Antonio National Park and most Pacific and Caribbean beaches. There are direct bus connections from San Ramon to La Fortuna (Arenal Volcano) and San Jose and many buses stop on the highway outside San Ramon going to Nicoya, Liberia, Guanacaste, and Nicaragua. Safe (electronic and manual gates), rustic, very secluded and rich in fauna (deer, coati, monkeys, and toucan). Many wild guava trees. Off-road vehicle or SUV advised within the development and in Costa Rica during the rainy season. Rental vehicles are available from a number of companies at the San Jose Airport and near the airport where taxis are available. Guests are encouraged to do the proper research to obtain the best deals Suv vehicles should be enough from Dec-May, the dry season. This is a perfect location for those looking for a Walden Pond type experience and want to be close to nature. Internet is available in nearby cities and cell phones are operative. Booked guests should arrive during daylight hours especially if making bus connections. If guest arrives at night, it may be a good idea to spend the night in Alajuela, 5 minutes away, and meet the owner in the morning. Detailed directions will be given to meet the owner at the highway entrance for check-in once the arrival time is confirmed. The entrance is on an easy direct route from the airport. Buses from Alajuela (5 minutes from the airport) to San Ramon and Puntarenas pass the entrance on the highway. There are taxis from the airport (expensive) to the entrance as well as from San Ramon. You can also meet the owner in San Ramon. Guests are asked to pay a refundable deposit of $20 for the use of the electronic gate and remote key, and keys to the manual gate and cabin. It is refunded with the mif deposit once the keys are returned. The deposit is already included in the damage deposit. This deposit has been reduced by a third since Nov, 2017. Wood armoire or wardrobe, washer/dryer, and portable grill now included! Also, a new stove has been installed and a new microwave and coffee maker. There are many grocery stores and fine dining facilities in San Ramon, Esparza, Palmares, and Puntarenas nearby. Puntarenas has two inexpensive ferries that cross the Gulf of Nicoya on which you can take your car. Dona Ana public beach is on the road to Puntarenas. I am an ex-pat from the US. Was born in India and was educated in the US near DC and worked as a librarian and teacher of English as a second language. I came to Costa Rica 9 years ago and have become a permanent resident. I have been teaching English and oil painting. My hope is for you to have a truly enjoyable stay in Costa Rica and I want to help in any way I can by way of advice or information. This property is very secluded and surrounded by trees and shrubs with a view of the Gulf of Nicoya from the road. The location is central and within driving time of most resorts and places to see. It is close to San Ramon as well as Esparza, Puntarenas, and Palmares. The setting is very peaceful away from any traffic and noise. San Ramon has a cultural center and farmer's market on Fridays and Saturdays as well as the big church of St. Raymond Nonnato. Central location, peaceful setting close to nature, and close to the port of Puntarenas and the city of San Ramon. Public beach of Dona Ana is 30 minutes away on the way to Puntarenas. Occasionally wildlife such as deer, pisote, monkeys, and toucan are visible. Wash basin, toilet, and hot water shower. Linens provided for the two beds. Car port next to cabin as well as plenty of space outside. Two sets of bath and face towels included. Living room set (sofa with cushions) and two armchairs. Brand new medium size fridge. Kitchen includes stove, fridge, microwave, coffee maker, hot water kettle, toaster, and slow and rice cookers. Plates, mugs, glasses, and utensils included. Some books and magazines in magazine rack. Small lawn behind cabin. Concrete steps from pation lead down to small grassy area. Spacious patio with forest view. Hammock included and secure hooks to hang it. A wheelchair can be pushed up the ramp around to the front door on the patio or can enter directly through the back door. Centrally located, 12 miles from the city of San Ramon, 10 miles from Esparza, and 18 miles from Puntarenas, a big seaport. There are inexpensive ferries that cross the Gulf of Nicoya on which you can take your car. Playa Dona Ana, a public beach, is on the road to Puntarenas. San Ramon, Puntarenas, and Palmares all have excellent restaurants. Between San Ramon and Esparza off the Pan American Highway about 20 miles or 35 minutes to Puntarenas seaport on the Gulf of Nicoya.